Jerusalem, 1984, a general view including the site of what was King David’s City. This rare painting measures 61 x 91 cm (24″ x 36″), oils on canvas, would suit a sophisticated private collection, hotel, or restaurant, available, £4,000. 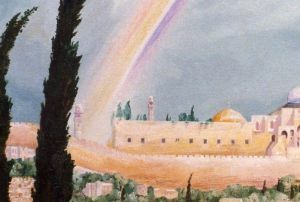 ‘Zion’ was a Biblical name for Jerusalem. Painted by me, Gordon Frickers following my first location visit way back in 1984, a camping tour of Israel. The painting reminds us that Israel was laid waste following the Arab Islamic invasion some 1400 years before this artist arrived there and as clearly shown in the collection painted by the Scots artist David Roberts RA (24 October 1796 – 25 November 1864). Mark Twain wrote “I could ride for 10 miles in any direction and not meet a single living soul“. He visited Israel in 1867, and published his impressions in Innocents Abroad. 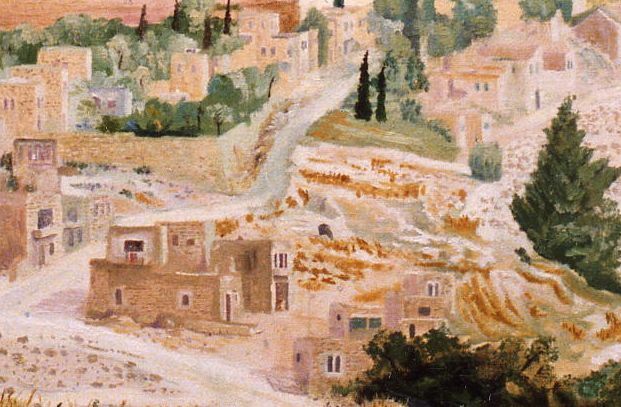 Mark Twain wrote he was amazed by the smallness of the then city of Jerusalem much of which was in ruins. About Temple Mount he wrote “Up to within a year or two past, no Christian could gain admission to it or its court for love or money“. 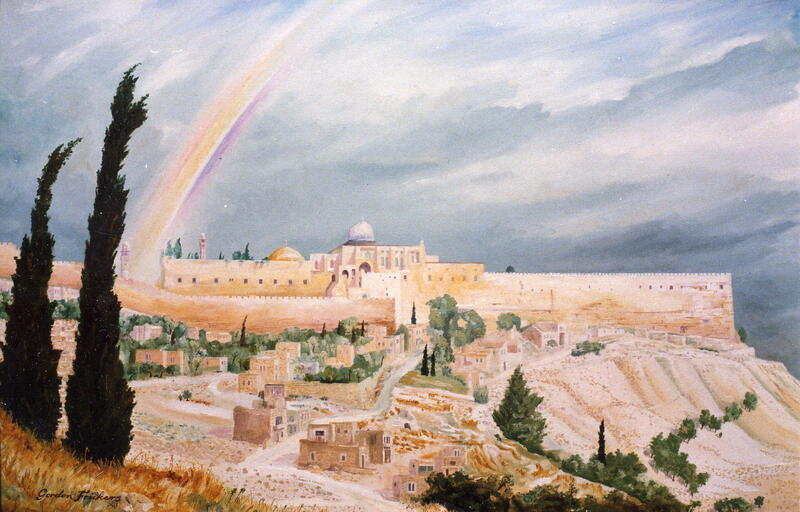 This emotive, unusual picture was one of several I made as general views of Jerusalem, one of only two I still have available. An example of my early works, this painting, kept in my home for many years, has become historically important so I’ve decided to make it available. Made from location studies, it clearly shows how under developed, poor and neglected Jerusalem was even in the 1980’s. Today the site is almost unrecognisable, the picturesque ruins have gone or in a few cases, been renovated. Some do argue so has the charm but people can’t live on charm. The site has a new life and a vibrant future. It was Napoleon Bonaparte who seeing the ruined desolate state of the land when in Israel first declared publicly, the Jewish people should return to their ancestral home land. Napoleon Bonaparte of the First French Empire enacted laws that freed European Jews from old laws restricting them to ghettos, as well as the many laws that limited Jews’ rights to property, worship, and careers. There are contradictory historical viewpoints regarding Napoleon’s intentions and feelings for the Jewish community of Europe, however that he did much to liberate and increase the social standing of the much oppressed Jews in France and Europe in general during and after his rule is undeniable. On this site, the city of David, by tradition, Abraham was instructed by God to sacrifice his son Isaac. What does it mean to us today if anything? The story of Abraham and the sacrifice of Isaac tells us, G-d sometimes makes extra ordinary demands, G-d may test us to the limit; but while life is a test, G-d does not require ‘human sacrifice’. “And Thou Shall Tell Thy Son In That Day Saying: It Is Because Of That Which The Lord Did For Me When I Came Forth Out Of Egypt” Exodus xiii, 8, also stated in the Pesach (Passover) Seder. “Zion”, the Biblical name for Jerusalem, is not just the three-thousand-years-old capital of the Jewish people; it is the intellectual, cultural and spiritual center of Jewish gravity. This is city of David the heroic, the psalmist, who conquered it and of Solomon the wise, who built the first of the two Holy Temples there. Without doubt, an inspired, important painting touched by something greater than the artist; recommend. Further reading: follow this link.